The land that would one day become Grand Canyon National Park was first protected as Grand Canyon National Forest by President Benjamin Harrison in 1893. Tourism to the park began in the early 1900s when the Atchison, Topeka & Santa Fe railroad line brought visitors to the South Rim in 1901, and the El Tovar Hotel opened in 1905. The National Park Service was formed in 1916, and in 1919 Grand Canyon National Park, the seventeenth National Park, was formed. Photograph of the pupils on the playground of Grand Canyon School, Grand Canyon (Ariz.). Photograph/lantern slide of the Grand Canyon (Ariz.) Railroad Station. Photograph of Soap Creek Rapids, near Lees Ferry in the Grand Canyon, Coconino County (Ariz.). Photograph/color postcard of an artist rendering of a trail drive in Arizona. When was the Grand Canyon first protected? When did it become a National Park? Why was the Grand Canyon made into a National Park? Why did people go to the Grand Canyon? 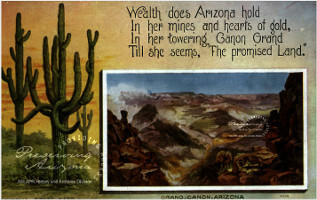 How are the postcards of the Grand Canyon different than the photographs from the same period? Why do you think this is?